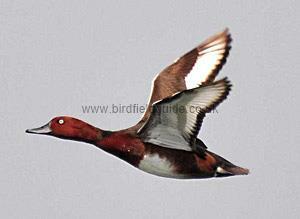 The belly and underwing of the Ferruginous Duck is white, note the distinctive bright eye of this Male. The upper wing has white wing bars similar to the Tufted Duck. 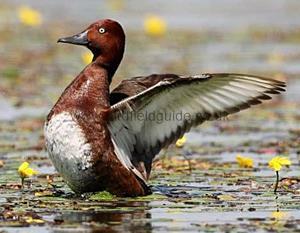 Central and Eastern Europe, Asia and North Africa are the principle breeding areas of the Ferruginous Duck. Very rare visitor to the UK, usually in Spring or Autumn. Population numbers have fallen in recent years and it is on the verge of being considered at risk. Prefers shallower water than most other diving ducks however outside of it's range it is usually seen with other species such as Pochard or Tufted Duck. Hybrids with Pochard and Tufted Duck are not uncommon, especially near the edges of the birds usual range. The Male Ruddy Duck in Summer eclipse has very similar plumage, however it is generally much duller and is a less vibrant chestnut colour. The bright white eye is retained which differentiates it from the Female. 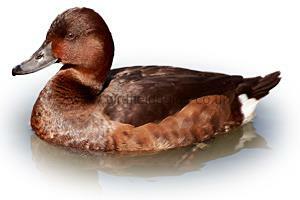 The Female Ferruginous Duck has a chestnut body, darkest on the back and palest on the flanks. It has a white undertail and belly and white wing bars in flight. Unlike the Male it has a dark eye. The Male Ferruginous Duck in Winter has an overall deep chestnut body, darkest on the back and palest on the flanks. The undertail is white and it sometimes has a dark ring around the neck. It is a short-bodied duck with a long neck and bill. In flight both the Male and Female have broad wing bars, white underwing and white belly. 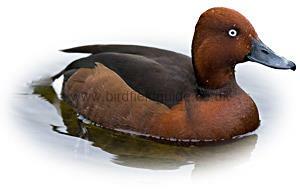 The Ferruginous Duck can look similar to a tufted Tufted Duck except it has a whiter undertail.